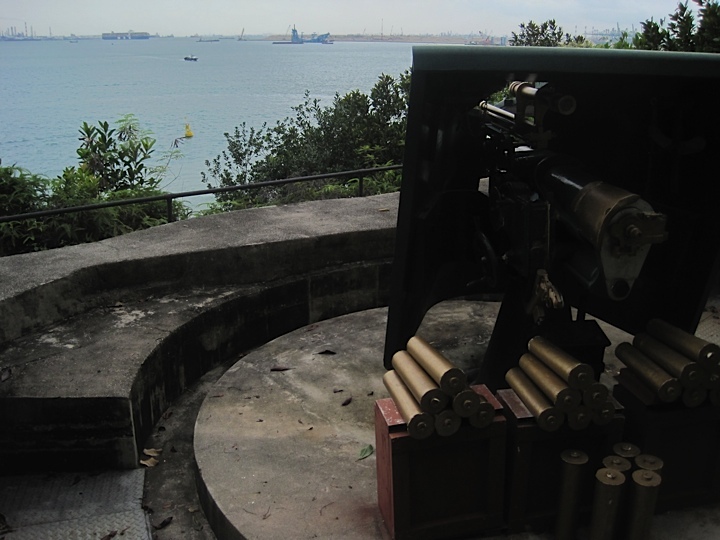 The WW2 guns of Singapore point south. I was in Singapore this week – which was an education in itself as one witnesses first hand how many of the Asian economies seem to be outstripping debt struck Europe. But I was also seeing first hand the sight of what, seventy years ago, Winston Churchill called ‘the worst disaster and largest capitulation in British history.’ On 15 February 1942, Lieutenant General Arthur Percival gave up Singapore to the Japanese. More than 60,000 British and other Commonwealth and Empire troops surrendered to an Imperial Army force of around 35,000. The prime reason for the disaster was the incompetence of the British leadership in Singapore – particularly that of the inept Percival – but complacency born of racism also played a part. The British simply couldn’t believe that the Japanese were capable of advancing through the Malayan jungle to the north of Singapore – but they did. In addition, the Asian theater of war had been depleted of many resources because the direct threat to immediate British interests – and, indeed, to the territory of Great Britain – came from Nazi Germany. And Japan, after all, was on the other side of the world. The British plan had always been that a strong naval force would act as the prime deterrent to Japanese aggression, rather than extensive land forces. But here too, British arrogance would prove costly. On 10 December 1941 two huge British battleships, HMS Prince of Wales and HMS Repulse, were sunk by Japanese planes, largely because the British government – headed by Churchill, of course – had allowed them to sail in these waters without adequate air support. As I walked through Singapore this week and saw the immense riches and drive of this small island nation, I thought of the ignorance in Europe and America today amongst many people about the vast economic strides that have been made – and will continue to be made in the future – in Asia. Of course, the warlike intentions of nations like Japan are no more. But the complacency the British had about the military capability of the Japanese 70 years ago is still reflected, I feel, in the complacency many people in the West feel about the economic potentiality of the East.